In 1955, our original wastewater treatment plant was constructed to address health problems from failing septic tanks in Santa Venetia. 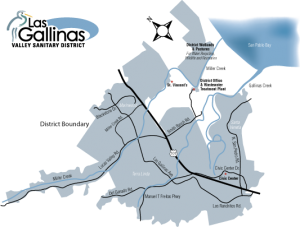 New development in north San Rafael resulted in annexation of Terra Linda in 1956, followed by other areas including San Rafael Meadows, Marinwood, Lucas Valley, and other communities. Major plant expansions were built in 1958, 1972 and 1984. The latter increased capacity to 2.9 million gallons per day with ponds to hold treated wastwater and spray fields that allow the District to withhold discharge in summer months to San Francisco Bay via Miller Creek. Current plans address increasing capacity to best serve the present and future residents and address maintenance, efficiency and regulatory issues.